Cybersecurity is more complex than ever, with sophisticated attacks hitting organisations all over the world every day. 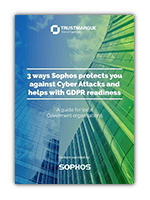 UK-based Sophos offers sophisticated and intelligent security solutions can help protect you against those attacks, whether it’s data loss prevention, ransomware protection, or cloud security. Relied upon by more than 100 million users across 150 countries worldwide, this expansive range of defence against virus threats and data loss is backed by big data analytics gained from its global network of Threat Intelligence centres, SophosLabs. Sophos has been pioneering the development of award-winning security products for over 30 years. With its “security made simple” proposition, it offers a broad range of protection solutions including Encryption, Endpoint, Web, Email, Mobile, and Network security. 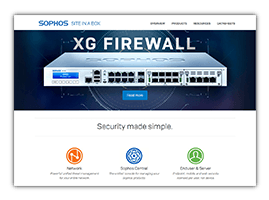 Sophos has a solution to every cybersecurity challenge and that’s why we recommend Sophos as an option to our customers. We offer in-depth technical expertise across Sophos’s solutions, protecting all areas within your business, including data, servers, virtual machines, mobile devices and endpoints to deliver comprehensive security solutions that really is secure. Intercept X combines deep learning with best-in-class anti-exploit technology, CyptoGuard anti-ransomware, root cause analysis, and more to form the industry’s most comprehensive endpoint protection. This unique combination of features allows Intercept X to stop the widest range of endpoint threats.